INDUSTRY.co.id - Jakarta - A prestigious award from Agoda for tourism actors in the world has been held. Indonesia also incised success, as many as 135 hotels and resorts in Indonesia reached the 2017 Circle Awards (GCA). Quoted from the facebook account of the Ministry of Tourism, one of the award-winning Rhadana Hotel & Resorts Kuta, Bali. The hotel managed to steal the show. Because, entered in the ranks of the best hotels in the world. "It is a great honor to announce the 2017 Gold Circle Awards winners, who recognize excellence in the hospitality industry. One of them is Rhadana Kuta, Bali. 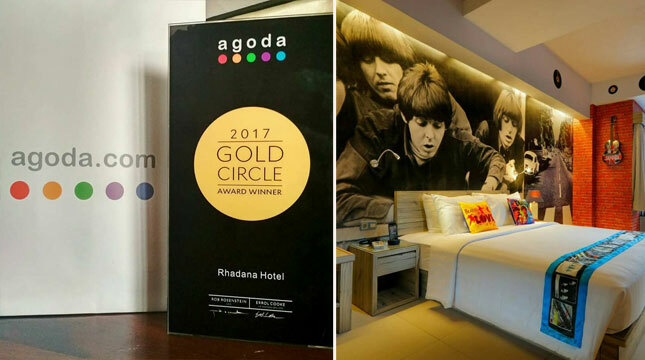 In addition, the number of hotels available on Agoda has risen to 1.6 million more worldwide, "Errol Cooke, Vice President - Partner Services Agoda said in a written statement on Saturday (24/3/2018). According to Errol, this award will increase significant competitiveness and operational standards throughout the hotel. Because, the Gold Circle Awards (GCA) become the benchmark in terms of service quality. "GCA is a tribute to a number of accommodation partners, especially with the best performance in the world, and of course shows the best quality online booking in the field of tourism, GCA is a good measure of the quality of hotel services," he said. Each partner incorporated in Agoda, must meet several criteria. Among the top 1 percent hotels in Agoda. Thus, consistently gained outstanding reviews from customers. Besides, competitive prices and commitment to deliver a great customer experience. Meanwhile, Business Development Director Rhadana Hotels & Resorts, Radhiyaksa Daulay said, Rhadana Hotel & Resorts always maintain, even improve, product quality and service. so that customers always feel safe & comfortable at home. "Alhamdulillah this is the work of intelligent Rhadana Troops who always work with Clean, Ikhlas, Sincere. We want to provide a good and different experience. Customer convenience is the main concept with Rhadana Soul, "he said. Rhadana Hotel, Kuta, Bali is always different. Of course with the quality of service and world-class hospitality standards. The hotel always managed to steal the attention of tourists. As Themed Boutique Hotel, Rhadana has 74 rooms with different themes and unique. No wonder if a number of national and international awards are often obtained. Rhadana Kuta, Bali is The 1st Modern Muslim Friendly Hotel with MUI Certificate in Bali. Also awarded Best Muslim Tourist Friendly Hotel 2016 at the National Halal Tourism Competition. This event is organized by the Ministry of Tourism of Indonesia. And won the "World's Best Family Friendly Hotel 2016" at the world's most prestigious annual. Namely World's Best Halal Tourism Awards held in Abu Dhabi late 2016 ago.